Octoin celebrates the New Year! There are only a few days left before the New Year and we are already starting to congratulate you with him. On December 27, we held a New Year's webinar. It was attended by the leaders of the Octoin from Asia, Europe and Africa. Congratulations from our representatives were made in many languages. Also, the speakers spoke about the prospects and plans of our company for 2018. Separately, the leaders spoke about a global conference for Octoin participants from around the world, which will be held early next year in Indonesia. Moreover, we announced the New Year's contest, the results of which will be summarized on January 6. Participate and win 2018 dollars! 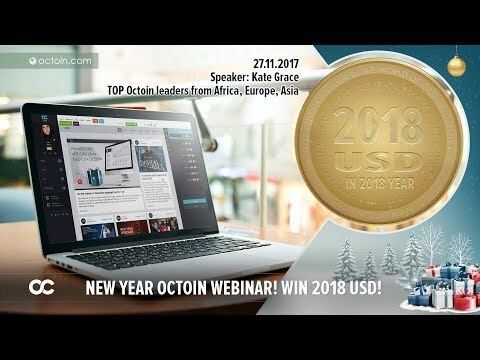 And if you suddenly miss this webinar, be sure to check out the video report (https://www.youtube.com/watch?v=KSIo1bsU6hc&feature=youtu.be) and come to the next one. We look forward to seeing you! Happy New Year and Merry Christmas!